Globito, under jockey Luis Vivanco, easily winning the $20,000 Evangeline Downs Dash on the opening night card Friday. OPELOUSAS, LA—OCTOBER 5, 2018—An invader from Texas stormed down the stretch and overcame the betting favorite as Globito recorded the first stakes win of his career on Friday night in thevv. The Texas-bred colt passed Jrs Taylors Runnaway to prevail in a startling time of :11.570 seconds for 220 yards over the fast track, just .04 off the 4-year-old track record held by FDD Going Grand. The final time equals a speed index of 107. Globito was sent off at odds of 9-2 following back-to-back victories at Gillespie earlier this summer. The 2-1 betting favorite, Jrs Taylors Runaway, started sharply from his outside post position, but was unable to withstand a strong charge from Globito, who won by half-length. Ms Leaving You rallied from mid-pack and finished third. The win was Globito’s sixth in nine lifetime starts and the $12,000 first-place purse increases his lifetime earnings to $42,518. Globito paid $11 for the win, $4.20 to place and $3.80 to show. Jrs Taylors Runaway returned $3.20 to place and $2.40 to show. Ms Leaving You paid $3.80 to show. Globito was bred in Texas by the owner, Isabel Huitron, and is trained by Josue Huitron. The 3-year-old colt was ridden to victory by Luis Vivanco. Globito is by Pappasito and is out of the Shazoom mare, Trampstamp. Coming off a win in the Gentilly Dash Stakes at the Fair Grounds in August, graded stakes winner Jrs Taylors Runnaway earned $4,000 for his second-place effort. Jockey Jorge Linares had riding call for owner Rosalio Espinosa and trainer Martni Trejo. Bred in Louisiana by Julien R. Stevens III, the Sir Runaway Dash gelding is out of No Matches Tonight by Royal Shake Em. He has earned $305,320. Multiple stakes winner Ms Leaving You, a half-sister to All American Futurity(G1) winner Mr Piloto, picked up $2,200 for third. McGehee Horse and Cattle LLC owns the daughter of Coronas Leaving You out of Ms Pilot Point by Splash Bac. Kenneth Weeks conditions the Grant Farms, LLC Louisiana-bred earner of $78,832. Mariacy King, Dm La Jolla, Memphis D Nasty, Lil Bro Big Streak, Straw Bux and Lil Gal Pal completed the field. 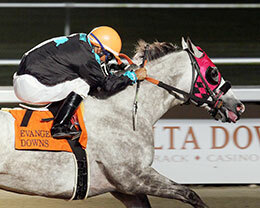 Live racing at Evangeline Downs will resume on Saturday night with a nine-race program. The featured event on the Saturday program will be the $30,000 Billy Montgomery Stakes with a field of 10 going 330 yards. The 3-1 morning-line favorite, Eying Louisiana Game, drew the rail for trainer Michael Taylor. John Hamilton is scheduled to ride. Post time on Saturday will be 5:35 pm Central Time.